*I was gifted this item by Everlane to review so this is a type of sponsored post though all opinions are my own. Last year when Everlane first came out with their Oversized Blazer I was reluctant to review it at first because I used to be a blazer person when I worked in an office, but knew I was no longer a blazer person because I work at a garage. I did eventually review it here, so take a look if you’re interested in getting the Oversized Blazer this year (I’m pretty sure it’s the same one). And TL;DR of that review: the blazer is super oversized so even though I’m usually a size 4 in Everlane, the size 0 was a good fit for me even though it was still a bit long from my 5’4” frame. In the end I returned that blazer because it just wasn’t working for me. But when I saw that this year that Everlane came out with a shorter blazer that they’re calling the Wool Academy Blazer, I really wanted to give it a spin even though I still work in a garage. 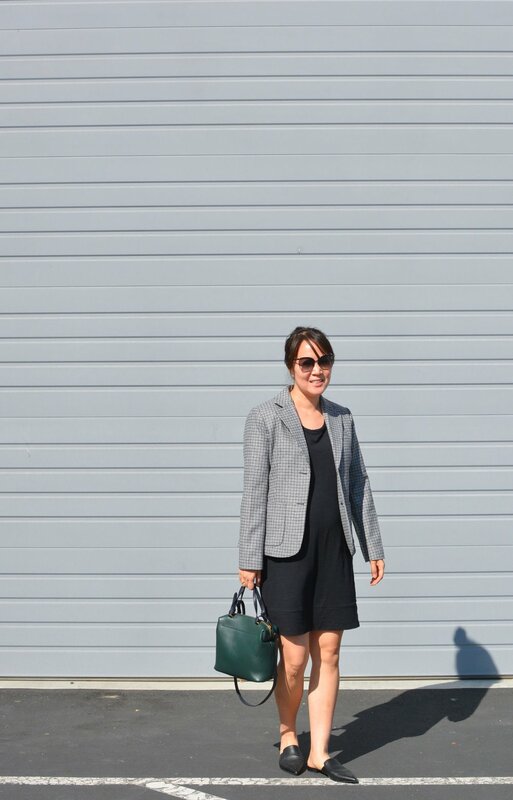 But I felt like Everlane read my review last year and gave us a blazer option for us short gals. So I wanted to give it a shot. And you know what? It’s now my new favorite blazer and outerwear option for autumn. Maybe I love a blazer even more this year because it hides the preggo belly somewhat or at least makes me feel more put together despite wearing loose clothing. Anyway I’m wearing a size 4 here and I find that it’s the perfect fit in both my arms, shoulders and length. So I would say it runs true to size, especially if you’re on the petite side. The material is 62% wool and 38% nylon and it’s a nice weight without being too heavy (perfect for cooler Californian days). The inside is lined so there’s no itchiness. And I love the mini check pattern for adding some interest though still being quite subtle. P.S. For those of you feeling tired of the sponsored content on this blog, I feel you. As much as I appreciate Everlane’s occasional sponsorship, I’m starting to feel a bit “sponsored-out” so I’m going to cool it for the next couple of months and review my usual unsponsored items. I’m also in general going to cool it on reviews because I’m also feeling like I’ve been acquiring a bit too much these days (especially when it comes to clothes). So I hope you guys enjoy posts about matters other than clothes! Also I’ll be skipping out on Friday posts for the next couple of weeks since I’m trying to put in more time on writing about other things (gotta admit reviews are easy but coming up with other interesting things to talk about is not as easy).